The Holidays always make me feel all warm and fuzzy inside, not just because I’ll soon be stuffed with stuffing, but also because it’s the perfect excuse to jazz up my surroundings and my loved ones’ lives with some festive crafts! 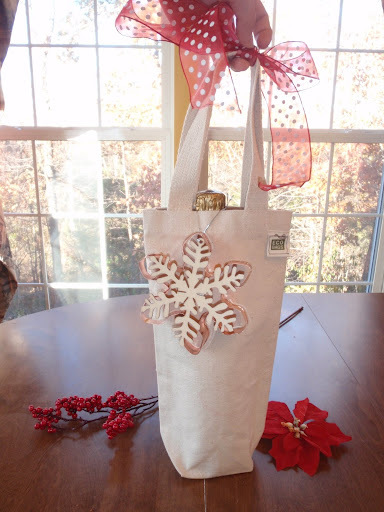 We just debuted our new recycled wine and gift totes and they are absolutely perfect ways to dress up your hostess gifts or give the perfect present this season. But being a blank canvas and all, they’re just begging for some adornment. So I gave it a go! In the spirit of being green, I elected to use old decorations, mostly from wreaths on their last legs, but did buy some new things that I thought would be really useful. I bought a fabric pen (which ended up dying after 2 uses) and a cookie cutter and ornament for some flair with purpose! 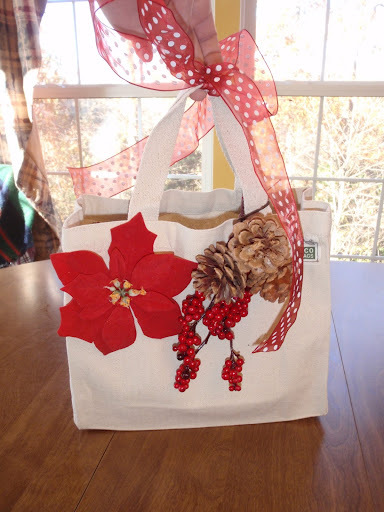 I love giving gifts and decorations that the recipient will actually get use out of while still making for a beautiful presentation. Here’s an easy one. 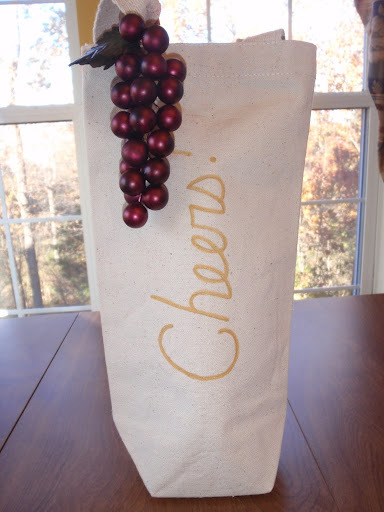 I used the fabric pen to write “Cheers!” in a festive gold and used a fake grape cluster from my grape/wine/vineyard-obsessed days to top it off. More of a champagne crowd? Scribble a “Pop!” and some simple graphics like these and you’ll be sure to get your point across; that point being, Let’s party! Sidenote: The wine tote is very roomy and fit both (on their own) of the bottles of champagne in our cupboard just fine. 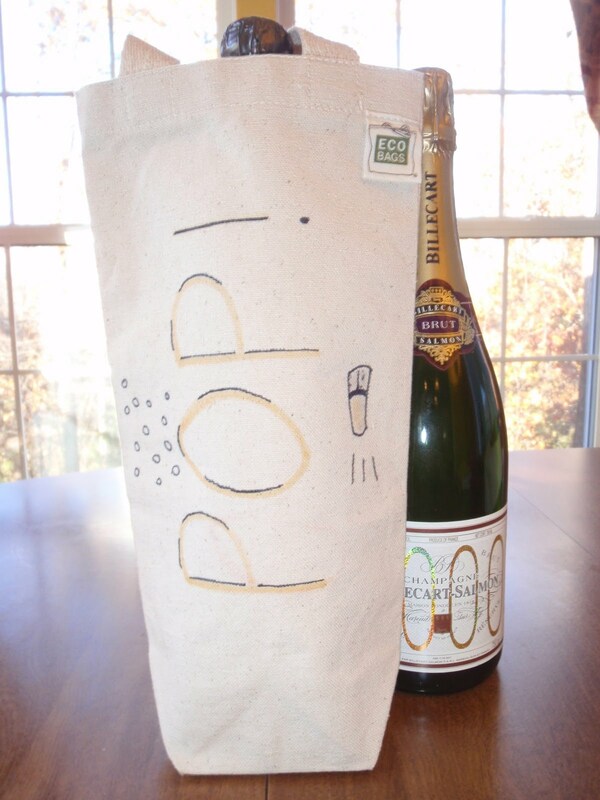 Wary of leaving a permanent mark on your wine tote? Then ribbon and ornaments are your friend! I love these little wooden ornaments because they’re beautiful as is or when colored in by a child. I top it off with a festive copper cookie cutter (behind ornament, same snowflake shape) and a bright red ribbon. For the gift bag, I discovered that Coco Chanel really was right about everything but namely about removing one thing before you leave the house. In this case, I removed my poinsettia and the Gawdy Police thanked me. Here’s a wine and gift combo I’d be proud to ring the bell with! Finally, I decided to go all out and chop up one of those cheap stockings that seem to accumulate in my holiday decoration bin for some unknown reason. Where do they come from?! 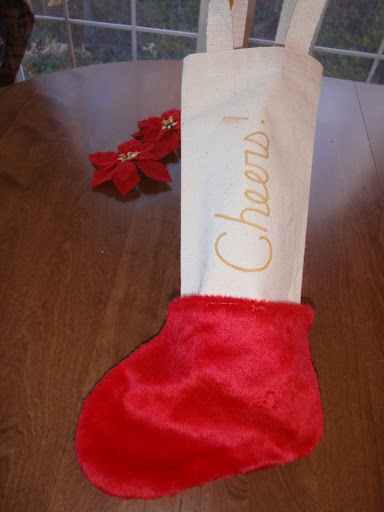 I cut off the foot (sorry Santa) and glued it to the bottom of the wine tote with fabric glue. Kinda cute! 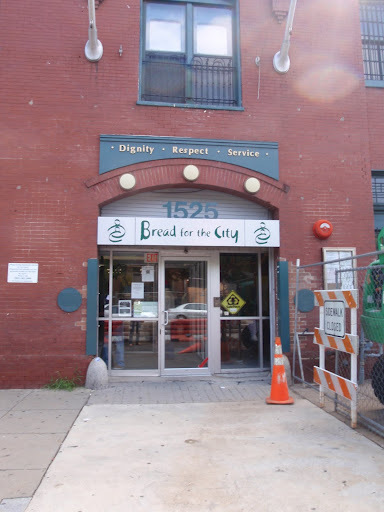 A couple months ago we introduced you to a truly inspiring organization in Washington, DC called Bread for the City. So far their bag drive has been a HUGE success but they still need more! Their upcoming Holiday Helpings program will provide over 8,000 people in the DC area with a low fat, nutritious holiday meal, including a full turkey and all the trimmings. That means it would typically take about 24,000 disposable bags to deliver these meals. Please consider helping Bread for the City eliminate plastic and paper by contributing your extra reusable bags. Each reusable bag eliminates 3 disposable ones from ending up in the trash, or worse yet, in the Anacostia River. We contribute by donating any less-than-perfect bags from our stock to Bread for the City. 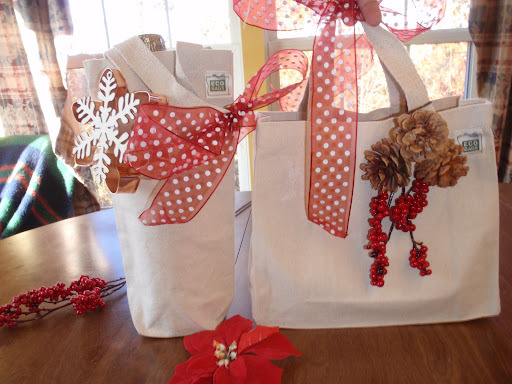 Bags of differing colors, shapes and materials – they’ll take ’em all! 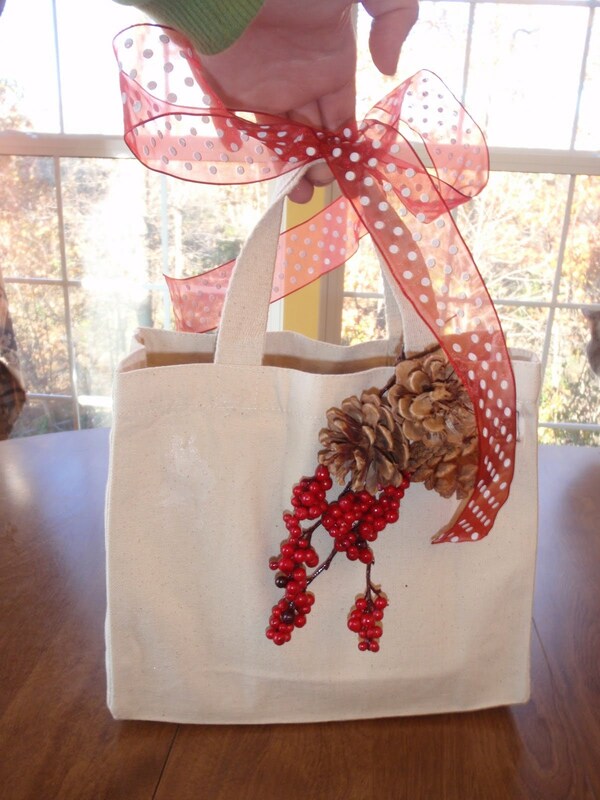 Host a bag drive at your school or work and help your family and friends get into the true spirit of the holidays. Once collected, please send your bags to the following address and make sure to include a piece of paper stating (1) Your name and (2) Quantity of bags you’re donating. Visit the Bread for the City blog for more info on the program and how to help. 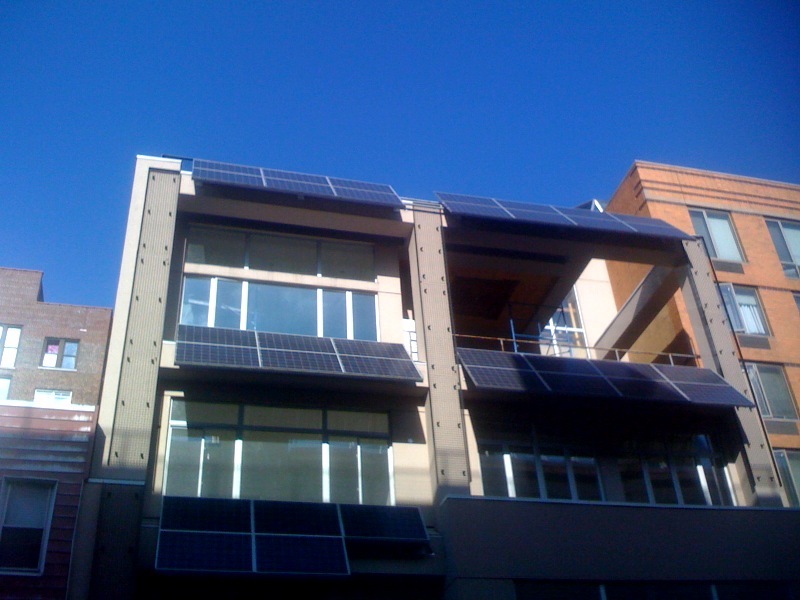 This photo is of solar panels our CEO saw in New York City. I, personally, have never seen panels displayed in such a way before. Usually people tend to hide or camouflage their panels but these are right out there, proud to be providing shade for their energy users! Yay for proud, green people! We invite you to join us in celebrating positive change. If we can get 20 changespotting photos posted on the wall of our ECOBAGS.com Facebook Fanpage, we’ll send out a free “Simple Ideas, Big Impacts” tote to all 20 spotters. So get out there and see the change in your world!